About the author: Dr. Anthony Dailley is a practicing dentist that specializes in halitosis treatment. He has been practicing since 1981 and graduated from San Francisco State University with a degree in Cell & Molecular Biology, and obtained his dental degree from the Pacific School of Dentistry. Dr. Dailley founded the The Center For Breath Treatment in the San Francisco Bay Area and conducts research on curing halitosis. Dr. Dailley has also been a founder in a biotech company called NovaBay Pharmaceuticals and on their board of directors from 1997 -2014. 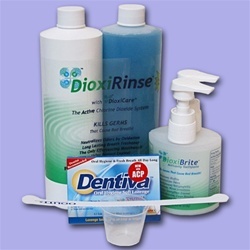 In addition to treating halitosis, Dr, Dailley also runs an online store where you can buy bad breath treatments. About the Author: Dr. Dailley is a bad breath specialist that specializes in curing halitosis. Dr. Dailley received his degree in dentistry from the University of the Pacific School of Dentistry and currently practices in the Bay Area. To better serve his international patients, Dr. Dailley established a premier online website where you can you can find remedies for bad breath.